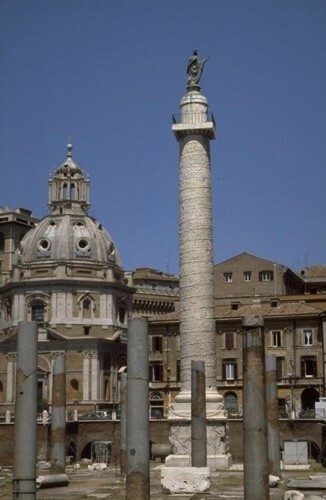 The column ( height 30 meters (98 ft) , overall length of frieze 200m ) was built in 113 AD and a special contribution of the senate of Rome to Trajan's Forum. The statue of the emperor stood on the summit. It is made from 20 enormous blocks of Carrara marble. The whole surface of the column is covered by carved reliefs of the highest artistic value that tell the story of Trajans two wars against the Dacians (who lived in what is today Romania). The base of the Column is a massive cube containing a number of small rooms. The column is hollow and contains a staircase of 183 stairs.